Admittedly, the tuba isn't the first (or even tenth) instrument that comes to mind whenever you think, Now what could make me look totally freakin' cool? First off, it's heavy as hell, the design is totally bonkers and musically it's rather limited - not a whole lotta riffing you can do on the thing. Shreddmasterstiff, who is so content in his coolness that he poses in his underwear (or some type of shorts that you shouldn't go outside in), has filmed a video (see below) in which he blasts his bitchin' oompa maker through a distortion pedal and amp. 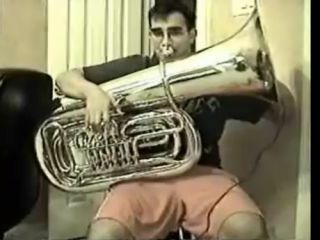 He calls it the 'original' electric tuba, and why would we work up the strength to argue with him? The sounds he produces, well, you have to check out the clip for yourself. But hey, the guy does a spirited Leper Messiah by Metallica - and he even takes requests. Needless to say, the school marching band is history.